Scotland captain Greig Laidlaw is coming under fire online for his post-match interview following the defeat to Ireland in Murrayfield. The scrumhalf went on a bit of a rant about referee Roman Poite, accusing the Frenchman of “not liking” Scotland. He goes on to blatantly blame the referee for incidents in the game, before saying he’s “not blaming” him. “O’Brien’s reefed the ball out and Romain has given a knock-on right in front of him.” Laidlaw said. "He doesn't seem to like us,"
Scotland captain Greig Laidlaw wasn't impressed with the performance of referee Romain Poite after his side were beaten by Ireland in the #SixNations. His comments have certainly not gone down well. 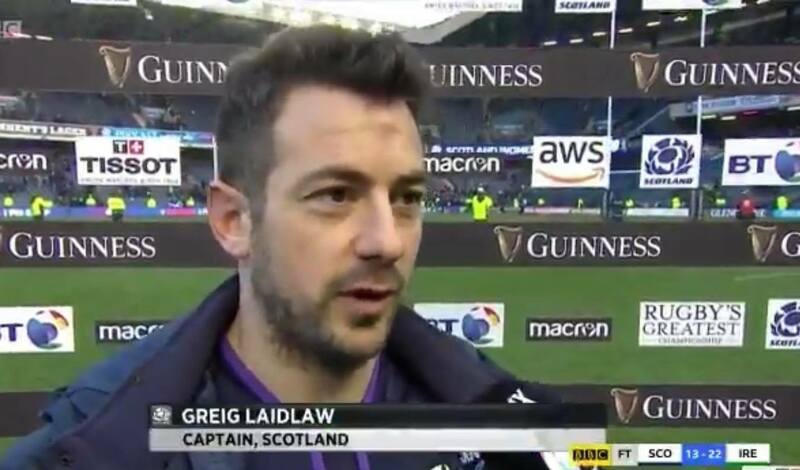 Disappointing comments from @Scotlandteam Captain Greg Laidlaw to criticise today's referee on post match TV interview. Poor Scotland decisions lost them that game, not the ref.